Andrénplast has been in business for one hundred years. Since the company’s founding in 1916, we have learned everything worth knowing about running a business and industrial production. Over the course of a century in the service of customers, technology, production methods, materials and, above all, society have undergone numerous changes. Keeping pace with development requires a capacity for unceasing curiosity, dedication and progression – qualities that truly characterise Andrénplast as a company, partner and supplier. 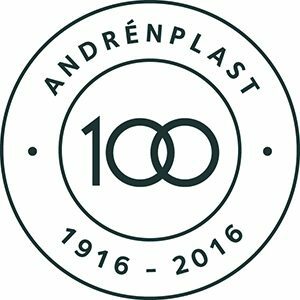 Since the ‘70s, the majority of production at Andrénplast has focused on the vacuum forming of plastic components. Most of our customers are from the automotive and electronics industries. Vacuum-formed products typically include dashboards, interior trim, panels and screens. Here at Andrénplast we are very proud of our enduring customer partnerships and we feel privileged to be able to work with some of the world’s largest and most well-known niche brands. Andrénplast is quality certified in accordance with IATF 16949 and ISO 9001. The certificates testify to the high demands we impose on our company and our suppliers and that we strive for continuous improvement throughout the production chain. But we do not need certificates to ensure that we focus on quality, since this is a natural part of our workday. If it wasn’t, we wouldn’t have made it through 100 years in the industry. Andrénplast is also environmentally certified in accordance with ISO 14001. Andrénplast does not use any substances in its production processes that require registration pursuant to REACH-regulation. Andrénplast AB has been a part of the company group CalixKlippan since 2008. This gives us the strength to develop on our own, at the same time as we can cooperate and develop together with our sister companies in the daily business. Andrénplast’s main office is in Gothenburg and our production sites for vacuum formed products are located in Gothenburg and Stargard (Poland), and also a unit in Malung.